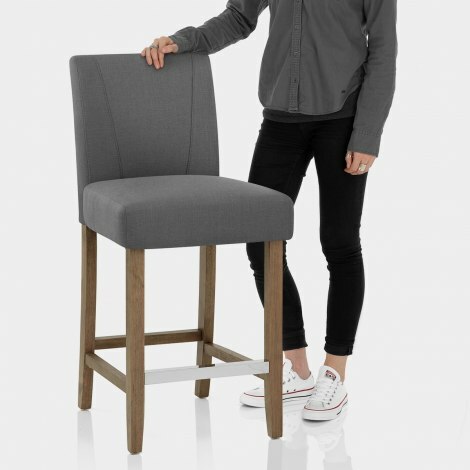 Choose the Chartwell Wooden Stool Grey Fabric and we guarantee that its understated elegance will enhance your interior. A sumptuous design with a traditional feel, the Chartwell Wooden Stool has so much classic character to bring to the bar area. Covered with subtle grey fabric upholstery, it blends seamlessly into its surroundings, complementing any colour scheme with its neutral charm. 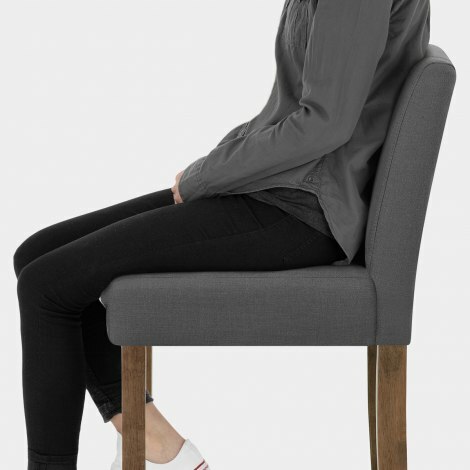 Embellished with simple rows of decorative stitching, the tall backrest is densely padded for support, while the cushioned seat pad rests on top of a traditional sprung-and-belted frame for a comfortable seating experience. Designed for use alongside domestic bar areas or kitchen counters, the fixed-height frame is finished with an authentic antique tone, and strengthened by horizontal bracing bars. Plus, for a contrasting contemporary touch, the footrest is formed of high-shine mirrored chrome. The Chartwell is complete with protective floor plugs beneath the legs, designed to help prevent damage to most floor types. "Love these bar stools, so comfortable"
Very impressed with my bar stools. Speedy delivery, very well packaged. Fit perfectly and very pleased with the quality and colour. Will be ordering more soon. Excellent product, easy to assemble, great quality, fast delivery. First time to use this company. Amazing service. Efficient and really happy with delivery. Quality of stool is great and value outstanding. The stools are of good quality and look the part when placed in the kitchen. Very comfortable to sit on. Glad to have made the purchase.